we recommend the longer rope for persons with a body size more than 1,75m. 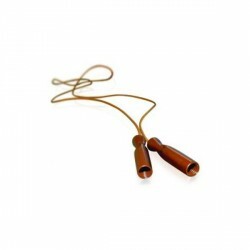 The Excellerator skipping rope professional leather is the fitness model of the fastest skipping rope of the world. The high-quality ball-bearings let the robust 6mm strong leather rope easily circle staying in form. The Excellerator skipping rope professional leather is usable for every kind of skipping rope training for endurance and coordination. The Excellerator skipping rop professional is even used outside boxing by athletes playingfootball, basketball, or athletics.